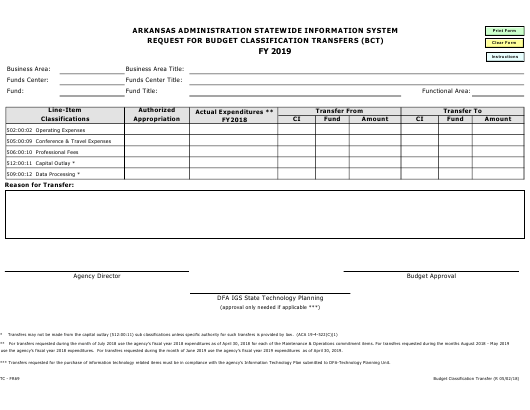 Form TC-FR69 or the "Aasis Request For Budget Classification Transfers (bct)" is a form issued by the Arkansas Department of Finance & Administration. Download a fillable PDF version of the Form TC-FR69 down below or find it on the Arkansas Department of Finance & Administration Forms website. use the agency’s fiscal year 2018 expenditures. For transfers requested during the month of June 2019 use the agency's fiscal year 2019 expenditures as of April 30, 2019. *** Transfers requested for the purchase of information technology related items must be in compliance with the agency's Information Technology Plan submitted to DFA-Technology Planning Unit.